Pigs react in various ways during pre-slaughter handling. Some animals show strong reactions because of their genetics. One example is the Piétrain breed, known to be stress sensitive. It is also well known that there are individual differences in pigs' reactions to stress. In a stressful situation some individuals from the same litter become very active while the behaviour of others is passive; this is due to different individual coping strategies. Furthermore, different past experience of handling has an effect on how pigs react during pre-slaughter handling; pigs that have had limited human contact may react differently from pigs that are used to being handled. This pig has arrived at the abattoir with a broken leg. Consequently it should be killed on the transport vehicle. Photo: Sture Andersson. The behaviour patterns of injured or unhealthy pigs during pre-slaughter is different from that of healthy animals. Any pig that is unable to walk, or is ill and will not recover, should be humanely euthanized on the farm and not transported to the abattoir. 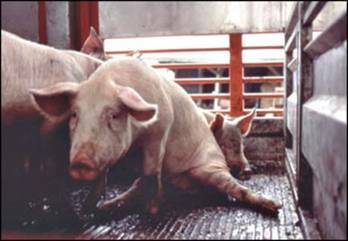 If pigs become injured in transit they should be handled in a humane manner and, depending on condition, be segregated and treated with appropriate veterinary care to facilitate recovery, be immediately euthanized or be transported as quickly as possible to the abattoir. In this video, the pig lying down is not sleeping. It is suffering from acute stress and is either exhausted or has adopted a passive coping strategy. Video: Sophie Atkinson.